Angus Pauley interviews Trent Anderson of Mountain Peak Productions about his product Pinpoint. Pinpoint makes personal locating easy in various situations including outdoor pursuits such as tramping, hunting and fishing. The technology requires no activation and relies on an intention system making it safer than a typical PLB (Personal Locator Beacon) that must be activated manually. What is a common misconception or something which people get wrong, when you explain Pinpoint? The most common thing that people don't quite understand is that we don't use satellite. Our device relies on a system that runs in the cloud rather than satellite. People often ask: why don't you use satellite? That's probably our main misconception when trying to explain Pinpoint to someone. What were you doing before Pinpoint? I grew up on a fishing boat. My father was a commercial fisherman. So I did a lot of fishing when I was younger. When I left school I studied for the Department of Conservation and did a trainee Ranger course up in Nelson. That got me into hunting and seeing more of the outdoors. After that I went and did some farming on a large sheep and beef station across Lake Wakatipu. That really got me up into the mountains, into some pretty hairy places. From there I ended up becoming a professional hunting guide, which was where I was for five years; guiding Americans, Russians and just exclusive hunters. Most of them retire, and then they fly around the world hunting animals. Five years of guiding those guys hunting is what started me onto Pinpoint. Was there an a-ha moment, or a particular moment of frustration in which you came up to the idea for Pinpoint? Yeah, so, the whole the whole Pinpoint idea was born out of frustration and an epiphany moment. When I was away guiding I came up with an idea and it wasn't actually for Pinpoint itself; it was for another product which was a hunter safety device to help people not shoot each other in the hunting seasons. In pursuing that we got into the circles of talking with Angels and then unfortunately it turned out there wasn't a large enough market in New Zealand to warrant the money that we were looking for to get it up and running. That was a bit gutting. Still to this day I haven't given up on it. It's an absolutely fantastic idea. What came out of the rejections was obviously a lot of frustrations, so I got out and about and got some fresh air doing a bit of hunting. I was actually up Mt Cook, hunting tahr when the a-ha moment came. I was a long way up the mountain and standing there I thought to myself if I fell over this huge big bluff system there's not much chance I'd survive let alone be able to physically activate the PLB (Personal Locator Beacon) I had on me. I would be relying on rescuers flying out in a helicopter and looking for hours to find me. So I got to thinking about how the PLBs worked. I had one on me at the time and I thought to myself there must be a better way than this. We'd already built prototypes for the hunter safety device, and, we'd sort of talked about being able to use it to locate someone if we needed to, but we hadn't really gone into much detail. From that day I started mapping it all together, building a plan in my head of how it would come across and how it would work. I had a lot of sleepless nights thinking my way through all of the road blocks. When I finally convinced myself it was good, I went and talked with the guys at Tussock Innovation and basically said to them, what do you think? Would this work? And you know and Jesse basically jumped at it and said "Hey we'll do the changes you want for nothing"
That allowed us to convert it to a search and rescue device and do all the ground testing and be really sure of ourselves that it was going to work before we went to the Angels and talked with them. It worked out really well. You mentioned Tussock innovation. Is there anybody else that's part of the Pinpoint team that you'd like to mention? We use 4Design in Queenstown and Will Grant there. He's just absolutely fantastic. He's not only done an amazing job on our designs and the CAD drawings, but when I talked to him and Jesse, I could pretty much tell straight away that it was someone I can relate with. You know, it's like a relationship you either love them or... you don't like them so much and I treat business like that. I have this real this gut feeling. And if I'm unsure. If my gut is a bit iffy about it, I'll go the other way. Will and Jesse felt right from the get go. They were involved and understood the project and where my direction was. Plus, they knew it was beneficial to them to help me out in the sense that if they think something's not going to work, they bring it to light for me and offer alternatives, opposed to letting me spend the money to have it not work. Awesome, awesome. So how did you come across FoundX? Through you guys. So I got an email. Or a text message. What was it? Haha. I was sent something inviting me along. I hadn't actually heard a lot about FoundX until the night so I didn't really know what to expect. Although, any time you get into a room with lots of likeminded people or business minded people that are looking for a good investment- I think it's a blimmen' good opportunity. I jumped at the chance to go to it and it's paid off really well for us. Do you have any particular moments or conversations that you remember from FoundX? Pretty much any conversation I had with someone that didn't understand Pinpoint. I really enjoy understanding how their mind-set works so I can explain it to them. It happens a lot with investors and older people that don't necessarily understand the technology involved with clouds and apps and how it all integrates. You know that they don't understand it straight off the bat but you put in the effort and they come around and then when see it see, their eyes light up and they go 'wow'. When that happens, you know this is a great... not to mention if you get someone that says "Hey, can we invest?” that's always a pretty good sign! FoundX was just like that - just great night with a roomful of great people. How do people currently solve the problem that Pinpoint solves? Ah, so it's kind of funny because Pinpoint sits in this tiny little niche, right? People can currently do intentions online or in person, but there is no physical product that ties to those intentions to help you find that person if things don't go to plan. Plus we're making it easy. When I came up with the concept we looked at other intention systems in webpages, Department of Conservation books things like that and there was nothing quite like our product or quite as easy to use. I said to the guys at Tussock Innovation that I want my father to be able to pick up his phone and use this thing and my grandfather too. I wanted it I want it to be so easy a child could use it. It's straight to the point that when you jump on your app. The first thing it asks is where you are going. I want it all so easy to use and accessible that you know that people just use it whether they think "I might just shoot out and go for a go for a run" or plan a bigger trip. They can just jump on the app. It takes 20 seconds and it might save their life. In Dunedin alone last year there was a guy up by Brockville here on the walking track that spent a night in the bush. I haven't heard the entire story but that's the sort of situation where our system works really well because you're not expected to be away for a long time. So you've mentioned running and you've mentioned hunting. How broad are the applications of pinpoint? The hardware that we've developed is something that we can manipulate fairly easily into other industries and for other uses. One of the major talking points that we really want to help with is people with dementia and Alzheimer's. About 70 percent of all the searches by NZ Police and Search and Rescue are for people with Alzheimer's and dementia that have just gone wandering through town. The guys that are going hunting and things are one thing because they're in a good mind-set and know where they are, but when you throw mental health into it- It's a whole different ball game. Outside of the mental illness scene, there's lots of other avenues we can we can pivot to. New Zealand is just full of outdoor activity and our hardware is so adaptable that at the beginning it was just picking a place to start. We chose hunting because my background is in the outdoors and because if we can find someone in the rainforest in Fiordland then we can find anybody with it. So it's a really good proving ground for the product. What is the most frustrating part of building a physical product? I've heard advice, or I guess a lot of people have talked to me about why we're not just building an app. The reason is I want this thing to be perfect. It's a rescue device. So if someone's life is going to depend on it we need to get it right. We could use off-the-shelf parts to mix and match and make something, but I would rather get this product nailed. If we put it on the market and it wasn't ready... and someone goes missing and relies on it and it fails, for us as a company we'd be ... we'd be buggered. But as far as building an actual physical product, I think for anyone that's going to undertake it, know it's massive. It's not at all easy, and I was very lucky at the start that I had Jesse and Mark from Tussock Innovation to guide me along the way because I know next to nothing about their side of things. I think the more you can simplify it, the better. We're in a situation where our whole system needs everything. You can't build the app without the device, which has made it really tricky for us, but other people that I've talked to; I've said to them, "Well, hey, is it possible that you can do it by just building that app?" Instead of having a physical device, can you just do it with your phone? That's the path I'd take if at all possible. Are there any organizations or people in particular who have helped guide the creation of Pinpoint, or been a part of making it happen behind the scenes? I mean there's so many. Startup Dunedin and Co.Starters was bloody good. 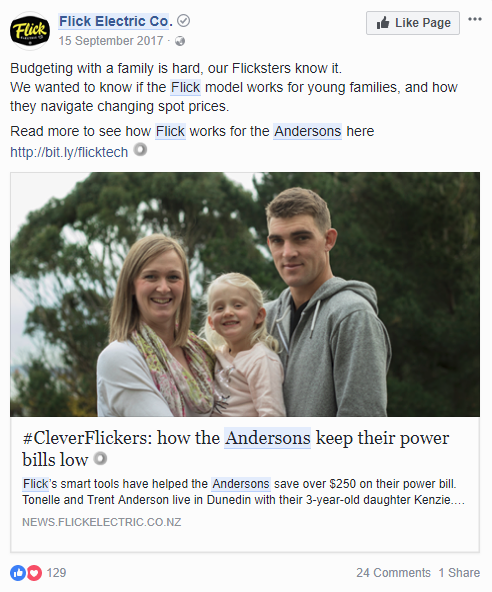 We've also had a lot of exposure from (laughter) it seems, really funny, from Flick Electrical. They promoted us when we were trying to get votes for the AMP scholarship. There's so much out there. I'd love to do more, but I can't because I'm still working a full-time job as a fencing contractor - a lot of the time I just can't get to stuff, that's what made Co.Starters timing so good. If you could somehow time travel and give yourself advice before you started Pinpoint, what would you tell yourself to do differently? Definitely something I would say to myself would be get ready for the long haul, because it's just not going to happen overnight. We've had a lot of situations where we've... I guess had the rug pulled out from under us. We've been so close to a deal or to funding or to something like that, and then for one thing or another we've ended up with having it pulled out from under us. If I could offer myself some advice, it would be just hang in there. It's hard. It's bloody hard. Even with all the support you've got around you ... I'm stubborn as ... I'm just so stubborn, and even I've had in my mind to give up. I've been pushed to the point where I've basically thought to myself, I've had enough. It's the people that I've had around me that have said, "No, you've come too far. Keep going. You've done too much. You're doing it really well. You've got a fantastic product." The thing that worries me the most is that it's not ... I don't know, it's not a can of soup that we're making. No offense to soup makers, but it's a product that's actually going to save lives. It's something that's going to take the risk off search and rescue staff or volunteers; it's going to cut their time down. It's going to help people in need. To give up would be just like throwing that all that way. I couldn't give up seeing what I've seen now. For example, I watched the news, and I remember in one state there were two lots of people missing in one week, and I thought to myself, both of those situations, our product solves the problem. Actually one of those people died, just from exposure, being there too long before they got found, I hate thinking to myself, that would have been a life we would have saved. Do you have a strange habit, or something which you do that even you, yourself, consider kind of absurd or kind of odd? So my wife and I, we're really house-proud, right? We love our house. So we always keep it clean, like even with a four year old it's usually pretty clean. But one thing that ... And I mean my wife is more OCD than me by far, but crazy girl, and she always laughs at me, because I can't stand cups in the cup cupboard out of order. Your mugs and your glasses ... Well, it's not even the glasses. It's the mugs, 'cause we have a couple different sets of mugs in there, and it's like my cup, and you have world's best dad cup and things like that, and it's all got to be in an order. And if she's unloaded the dishwasher and thrown it all in there and I go to get my coffee in the morning...and this'll be like 5:30 in the morning before I go to work, I'll change them all back the way that they need to be. The other really good one would be that I don't like if I go to someone's house and they have their cutlery drawer and rather than knives, fork, spoon, they've got knife, spoon, forks, I don't like that either. It annoys me. Yeah, yeah, I think that's it. Something like: "Pinpoint calls for help, even if you can't." ...I'll probably get some backlash of people that are really good at doing slogans and things like that but I think it would do the trick.